Chita Rivera. Photo by Joe Sinnott/WNET. That’s a wrap! Not even winter storm Juno could stop legendary Broadway star Chita Rivera from performing an intimate concert of audience favorites for her intrepid fans during last night’s Great Performances taping. Recorded live at Jazz at Lincoln Center’s The Appel Room in New York City, the evening will be part of an upcoming PBS special to be broadcast later this fall. Read more, below. 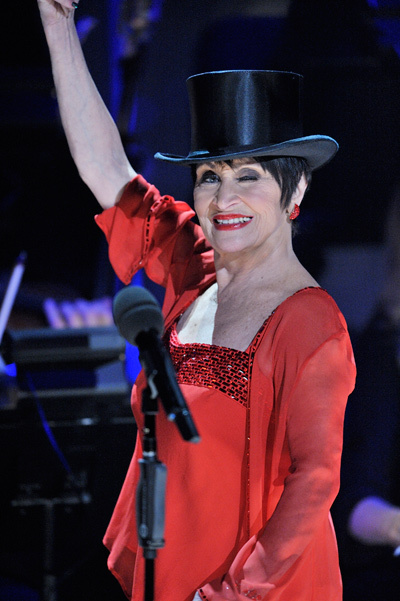 Legendary Broadway performer Chita Rivera has been lighting up Broadway and international stages for over sixty years. With starring roles in such iconic Broadway shows as West Side Story, Bye Bye Birdie, The Rink, Chicago and Kiss of the Spider Woman (to name only a few), Rivera was also a frequent guest star during the golden age of television variety specials. In April, 2015, Rivera is returning to Broadway to star in the final John Kander/Fred Ebb/Terrence McNally musical, The Visit, at the Lyceum Theatre. No matter the venue, Rivera has always wowed audiences with her peerless show biz virtuosity. Produced by THIRTEEN, GREAT PERFORMANCES is currently creating a special retrospective to celebrate Rivera’s extraordinary career then and now for broadcast as part of PBS’ Fall Arts Festival 2015. As New York’s flagship public media provider and the parent company of THIRTEEN and WLIW21 and operator of NJTV, WNET brings quality arts, education and public affairs programming to over 5 million viewers each week. WNET produces and presents such acclaimed PBS series as Nature, Great Performances, American Masters, PBS NewsHour Weekend, Charlie Rose and a range of documentaries, children’s programs, and local news and cultural offerings available on air and online. Pioneers in educational programming, WNET has created such groundbreaking series as Get the Math, Oh Noah! and Cyberchase and provides tools for educators that bring compelling content to life in the classroom and at home. WNET highlights the tri-state’s unique culture and diverse communities through NYC-ARTS, Reel 13, NJTV News with Mary Alice Williams and MetroFocus, the multi-platform news magazine focusing on the New York region. WNET is also a leader in connecting with viewers on emerging platforms, including the THIRTEEN Explore App where users can stream PBS content for free. Previous Post The Last Ship Closes on Broadway. Why? Next Post Cheek to Cheek Wins Grammy Award!